The book follows the story of three boys -Crispin, Myles and Jude who have been taken as ward by a mysterious rich man. The three get the life most people can only dream of. As it turns out later there's something common between the adolescents and they were not just chosen randomly. The very way the story is told gives off the feeling something is going to happen. And I mean something very, very bad. It was suspenseful at first, all right. And WOAH, it actually happens- literally in the last chapters. Now here comes my problem. I know, the action was building for that moment of discoveries and revelations/ realizations the whole time. But to me it all felt a bit too over- dramatic and over the top. In short- there is a lot of mystery, a pinch of romance /although not much focus on it, but there are some hot scenes among the whole waiting-for-the-storm-to-come /. 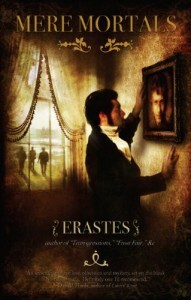 And I love the way Erastes works with the very language. It was the plot development that didn't really work for me.